This wireless earbud has a simple, discreet design for business users wearing professional attire or for public safety users working undercover. 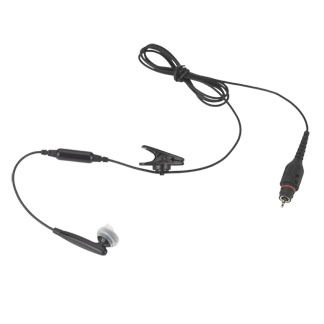 This earbud has an inline microphone that is ideal for transmissions in loud environments and comes with 3 sizes of eartips for optimal comfort. The long cord gives you flexibility in where you clip the PTT on your belt or shirt pocket. This earbud must be connected to the appropriate push-to-talk pod. Police officers and other first responders wanting a secure solution with fast pairing will need to order the (NTN2571), while professional users wanting a cost-effective wireless solution need to order (NNTN8127).